A spray of countless bubbles is jetted at the opposing Pokémon. This may also lower their Speed stats. The user tucks in its head to raise its Defense in the first turn, then rams the target on the next turn. The user hardens its body’s surface like iron, sharply raising its Defense stat. The user throws a stone or similar projectile to attack an opponent. A flying Pokémon will fall to the ground when it’s hit. The user burrows, then attacks on the next turn. It can also be used to exit dungeons. Boulders are hurled at the target. 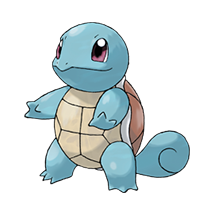 This also lowers the target’s Speed stat by preventing its movement. The user heightens its mental focus and unleashes its power. This may also lower the target’s Sp. Def. The user flings its held item at the target to attack. This move’s power and effects depend on the item. The user tackles the target with a high-speed spin. The slower the user compared to the target, the greater the move’s power. The user gathers all its light energy and releases it at once. This may also lower the target’s Sp. Def stat. Striking opponents over and over makes the user’s fists harder. Hitting a target raises the Attack stat. The user attacks everything around it by swamping its surroundings with a giant wave. This can also be used for crossing water. The target is slugged with a punch thrown at maximum power. This can also be used to move heavy boulders. The user charges at the target and may make it flinch. This can also be used to climb a waterfall. Diving on the first turn, the user floats up and attacks on the next turn. It can be used to dive deep in the ocean. The user flails about aimlessly to attack. The less HP the user has, the greater the move’s power. The user cloaks itself and its allies in a white mist that prevents any of their stats from being lowered for five turns. The user covers itself with mud. This weakens Electric-type moves for five turns. The user rests to cure itself of a poisoning, burn, or paralysis. 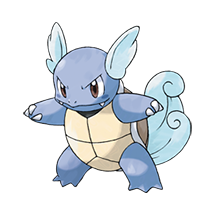 The user spouts water to damage opposing Pokémon. The lower the user’s HP, the lower the move’s power. The target is attacked with a shock wave generated by the user’s gaping mouth. The user attacks with a gust of chilled air. This also lowers the opposing Pokémon’s Speed stats. The target is slammed with a steel-hard tail. This may also lower the target’s Defense stat. The target is hit with a watery blast. The user can’t move on the next turn. A column of water strikes the target. When combined with its fire equivalent, the damage increases and a rainbow appears. The target is thrown using the power of gravity. It inflicts damage equal to the user’s level. The user copies the target’s last move. The move can be used during battle until the Pokémon is switched out. The user attacks the target by smashing into it with incredible force. This may also confuse the target. 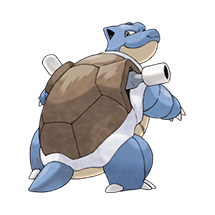 What do think about Blastoise?